This time we get more Takuya! First up is Flamon. 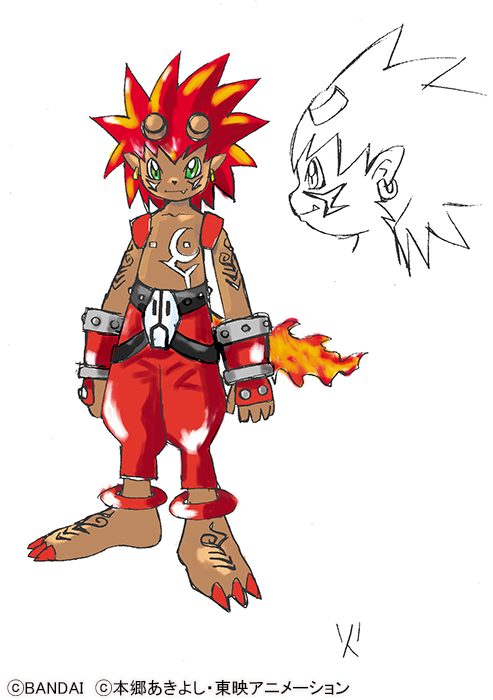 This is rough art of his final design, plus a sketch of his face in profile. Then we get his beast form! Vritramon is a nearly final design with just a few color changes. Less than a week until the Frontier Blu-ray box is out! Aww, no beta names this time. Was hoping BurningGreymon was his "original" name before they changed it. In terms of design, I think I like this one better, even if theyre not much different to each other. Oh so Vritramon wasn't skipped. But along with Flamon! 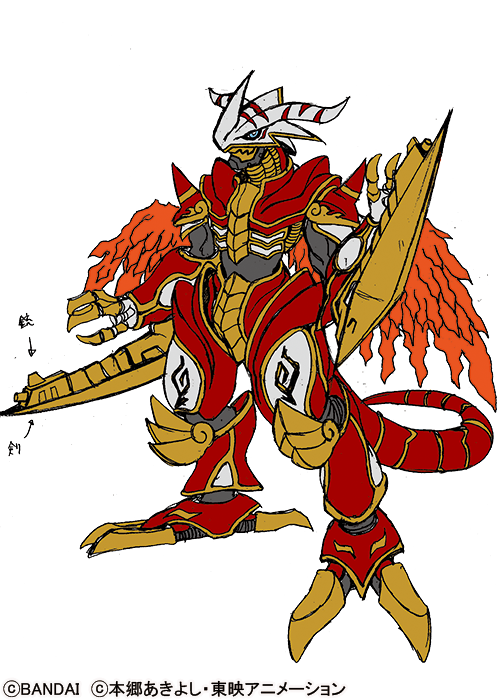 But I remember how AncientGreymon being miscolored differently in old magazine scans looked scarier. Was it prototype or simply miscolored due to printed official images tend to be miscolored like few certain anime series? Aww, no beta names this time. Was hoping BurningGreymon was his "original" name before they changed it. I get to enjoy and be smug that the dub names were actually from Bandai JP themselves, and were going to be used in the original as well, meaning people should have less reason to hate them. I mean, is anyone going to argue that MetalKabuterimon isn't a 'super' obvious name for a metal bug hero Digimon? The 'opposite' could be argued even if you 'were' right. Basic easy names were written on sheets early on when they were trying to find the 'right' name, they chucked them for names they felt were superior, and then when the characters were used elsewhere, they gave them the names they had previously trashed because they were simpler. There is also something really weird about bragging about wanting to act smug in that fashion, especially with how often you are wrong about stuff. Can we all agree this little boy needs his own series so bad!? Seriously I really want to see a videogame in which you can choose Flamon & Strabimon as your starters! Only Shutumon, Blizzarmon, Lowëmon & KaiserLeomon (+ Bokomon) are left. We'll find out if Korikakumon is a thing. These are nice. Bit of a shame they never had ideas for the versions for the others. But of course, that's what Frontier is huh. Only stuff for the main two. heh But I'm still glad we're getting these.